If I needed any more convincing that the Sun Mountain Club Glider is a good invention, Boston’s Logan Airport provided it around 24 hours ago when I went to catch my flight to Scotland for the Golf Road Warriors Scotland trip. Central Parking was full, which meant a trek to the “Economy” Lot – which is about 8 blocks away. Once parked there, my trip to the check-in counter involved wheeling my suitcase and golf travel bag 1000 or more yards, with three elevators in and amongst them. In this situation, having a travel bag that you don’t need to use your own strength to support was a godsend. When I first saw this product on the Golf Channel’s Fore Inventors Only program a few years ago, I thought it looked like a good idea. The Sun Mountain Club Glider’s extendable legs and pivoting wheels make it easy to move around and, of course, the biggest benefit is that none of its weight falls on you as you’re moving it. That’s 20 pounds (or more) that YOU don’t have to lug around. From the Economy Lot at Boston Logan through the airport in Glasgow and in and out of the cargo hold of the Machrihanish Dunes courtesy shuttle (replete with oversized black sheep adorning its sides! ), the design of this travel bag made moving around with a big piece of luggage about as easy as it’s going to get. With other travel bags, I used to constantly have to bend over to access anything. When you’re tall, that’s a pain. (Even if you’re not, it can be a pain.) With the Club Glider, you can get at the bag’s pockets more easily. 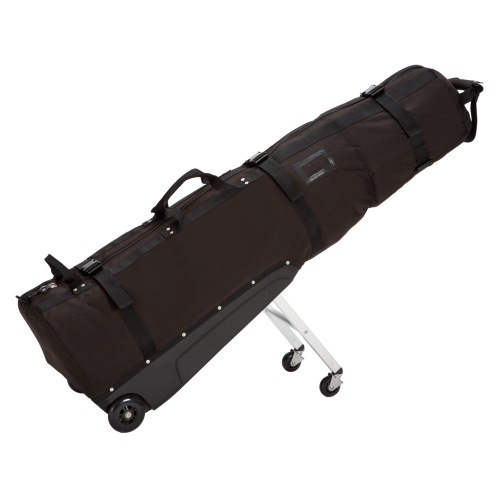 Another great benefit of the Club Glider is that it’s about 1000% percent easier to load your golf bag into this travel bag than others. Same goes for taking it out. And when you’re playing 7 courses in 7 days, you want to save all the wear and tear on yourself that you can. Plus, when it’s in Glide-mode, it stands quite happily all by itself. No more travel bag crashing to the airport floor as you search for your missing passport at check-in. The Club Glider comes in three sizes. The one I’ve been using is the original size, now called The Meridian. It also comes in Pro size – which is large enough for tour bags, and new for 2012 there’s the Journey model, which features a tapered design, so it’s smaller and lighter than the others. All of them are well made, with heavy-duty zippers, and they protect your clubs well in transit, too, thanks to thick foam padding that extends down the bag to cover both clubheads and shafts. It’s got two pockets on the outside and more on the inside, with internal cinch straps, too. The last thing I’ll say about this beauty is that with the Meridian size at least, I was able to fit two pairs of golf shoes, a rain suit, two dozen balls, a few hats, and two windshirts in the travel bag with the clubs. This took it right up to the weight limit that the airline would accept, and freed up room in my other suitcase for more valuable things. Like the Springbank Whisky I plan to bring home.